Now that your little bundle of joy has arrived, you will need to make a visit or two to your child's health care provider during the first month. Usually, the first visit will happen within the first few days of the birth, while the second check-up will occur a few weeks later, towards the end of the month. Many doctors and midwives like to see a newborn within the first week that they are born. During this time, your baby will have a check-up to ensure that he is healthy. This gives you the chance to address any concerns or questions that may have occurred to you since the birth, such as problems with nursing. Your health care provider will probably begin the appointment by inquiring about how you and your baby are doing before they measure your child's height and weight. Next, your newborn will receive a thorough head-to-toe physical examination. Her eyes, ears, nose, mouth, throat, arms, feet, legs, hands, stomach, back, spine and neck will all be examined. Her skin will be checked for any discolorations, rashes or birthmarks while her respiratory function will be checked either with a stethoscope or just by sight. Their genitalia will also be examined to make sure there are no problems. If you are unsure about any aspect of your baby's needs, ask your health care provider about it. They are a great resource that can provide you with a wealth of knowledge abut how to best care for your child. And don't be embarrassed by your question or think that it will make you look like a bad parent. If you can't figure out how to get a diaper on properly, ask! You are far from being the first parent who just can't get that diaper on in their first or tenth try. You will probably return to your newborn's health care provider again before the end of the month for another check-up. This second appointment will be similar in scope to the first one and will help ensure that your baby is developing properly. Whether you are being followed by a midwife or doctor will make a difference in the number of appointments you have those first few weeks after the birth. A midwife will most likely visit you at home every day for three or fours days following the birth and will continue to see you regularly for the first six weeks after the birth. 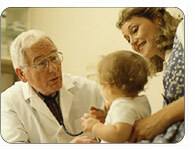 After this time, your newborn will begin to be followed by a pediatrician or your family doctor. If your newborn's primary care giver is a doctor, then they will most likely be seen by the pediatrician or family doctor within the first ten days of birth and then again two to three weeks later. Having a new baby? Talk with other new moms in our chatroom.